"We become His friends as we serve others for Him. He is the perfect example of the kind of friend we are to become. He wants only what is best for His Heavenly Father's children. Their happiness is His happiness. He feels their sorrow as His own because He has paid the price of all their sins, taken upon Himself all their infirmities, borne all their troubles, and felt all their longings. His motives are pure. He seeks no recognition for Himself but to give all glory to His Heavenly Father. The perfect friend, Jesus Christ, is completely selfless in offering happiness to others. "When we reach out to give succor and to lift a burden, He reaches with us. He will lead us to those in need. He will bless us to feel what they feel. As we persist in our efforts to serve them, we will more and more be given the gift of feeling His love for them. That will give us courage and strength to reach out again and again in faithfulness. "And, in time and in eternity, we will feel the joy of being welcomed to the company of His faithful friends. I pray for that blessing for all of us and for those we will serve." The concept of "friend" has lost much of its meaning in our modern colloquial usage. For example, many people have connections on social media called "friends" whom they barely know and have no direct personal contact with. But the concept President Eyring is discussing has much, much more import than that. 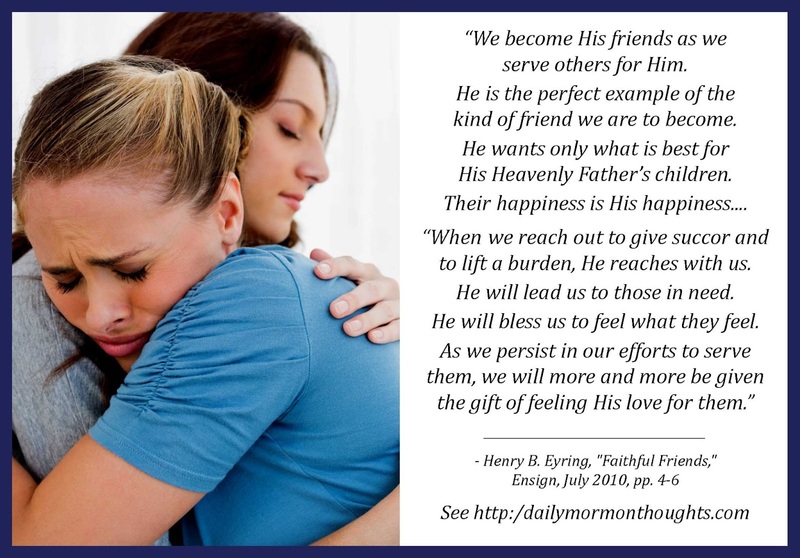 The idea of the Lord calling us His friends is a sacred one to me. 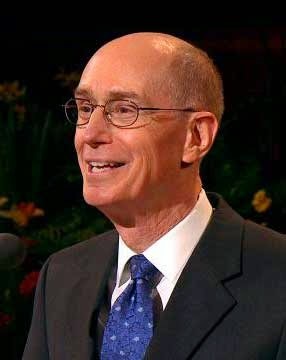 President Eyring explains that He saves the title "for those who have been faithful in their service with Him." In effect, we have to qualify for the right to be called a friend. Perhaps we see a semblance of that in our relationships with each other; we become closer and more dear to each other when we serve and give. And that is exactly what President Eyring encourages us to do—follow the Lord's perfect example by giving pure-hearted, loving service to those around us. The Savior's service was, and is, particularly beautiful and holy because it is utterly and completely unselfish. "He seeks no recognition for Himself but to give all glory to His Heavenly Father. The perfect friend, Jesus Christ, is completely selfless in offering happiness to others." As we learn to serve with pure hearts, we will sense the wonderful joy that comes from following in His steps.